Eyebrows are so important in framing the face-- and a little can go a long way! Here's Sara's #makeuptipmonday for you: "My personal pro secret behind awesome brows is an angle brush and two shadow colors. Not just one, but two. Use a slightly darker shade and outline the brows. Take your brush and drag the color into the outer half of the brows. Then, take the lighter color and brush it into the front half of the brows. Having two colors will mimic your natural brows hairs creating a more natural look. If you ever feel they're too dark just take aclean mascara wand and brush them in the direction of the hair growth, to remove excess product! My go-to is Anastasia Beverly Hills Brow Duo! Or, your favorite matte eye shadows work just as well!" Makeup Tip Monday: Goodbye Tired Eyes! I'm pretty sure there are days we ALL need this #makeuptipmonday from Sara. "Do you ever wake up and feel that you look super tired? If so, go grab yourself a white or beige eye pencil. To make your eyes look brighter, wider, and more awake add one of these lighter color pencils to the waterline. It will look like you got a whole night of sleep! My go-to is the Charolette Tilbury Rock 'N' Kohl Eye Cheat Pencil." Your #makeuptipmonday fix is right here from Sara. "Does anyone feel they can never get it as good as the pros? There a few key tricks to get a perfectly blended look. The first, is when blending hold your hand closer to the end of the handle (away from the bristles) this will give you less-control, but allow for softer blend and will not remove product. If you are trying to pack or layer on a color (specifically on the lid) hold your hands closer towards the bristle to have a heavier application. Also, never forget a primer. My favorite is Urban Decay Primer Potion!" This is a fantastic #makeuptipmonday from Sara! "If any of you ladies use a Beauty Blender, you know sometimes they get smushed or ripped when thrown into your makeup bag. This clever storage tip will help prevent it: grab yourself a plastic Easter egg. The beauty blenders resemble an egg shape and fit perfectly into these. Easy fix and no more destroyed beauty blenders!" This morning's #makeuptipmonday is from Sara. "Do you have any redness or blemishes on your face? My makeup artist Tip to combat the redness is green concealer. You heard me right...green! The green color will counteract and neutralize the redness in your face. Remember: apply in a thin layer under your foundation. My must-have green concealer is NYX Green Concealer in a Jar." With SO many different shades and tones of foundation out there in the world...how are you supposed to find the one that's the right match for you?! Here are some great things to keep in mind; some advice from Rachel: "To choose the perfect shade of foundation you should test it on your neck because your face and neck are the same color (the arm is generally darker than the face or neck area so it generally isn't the best place to test what will match your face.)" Fabulous #makeuptipmonday from Sara! "Dry and flakey lips a problem? To help your lipstick apply more smoothly, you need to exfoliate. The best part is, you can use some common household products to do so. Grab some brown sugar and coconut oil to create a scrub. Mix together and use a toothbrush to lightly exfoliate the lips. Rinse and add some Vaseline to hydrate. The next morning, your lipstick will glide right on!" Today's #makeuptipmonday is more of an educational piece for when you have your Makeup professionally done. 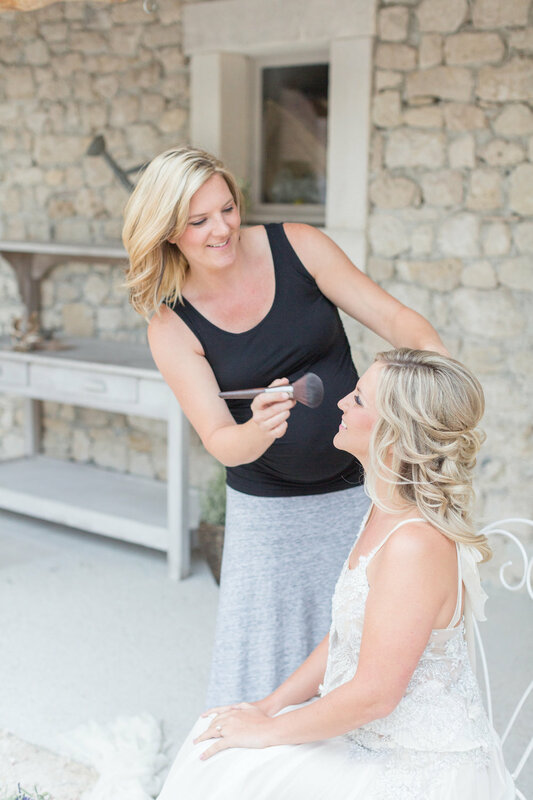 One of the questions we ask our brides during our first phone call, is their preference/experience when it comes to Airbrush or Traditional Application of foundation. This isn't because there's a large difference in the finished look. Quite the opposite! Achieving a flawless complexion that will last alllllll day can be done with either and both methods. The difference, is simply the form of application. The WAY the makeup is applied. You can use "airbrush foundation" on a beauty blender, and apply it by hand! So why do we ask, then? Because comfort of our clients matters. And sometimes, if someone has had a positive, or negative experience in the past with one form or the other, that's what they're drawn to...or. away from. In a phone call with a #jolbride, Murrey, (who is getting married very soon!) she had the clarity to articulate essentially, "I've had airbrush makeup before, and it's not that I didn't like the airbrush, I just didn't care for the way my makeup looked as a whole." BINGO. But our negative experiences can often influence the way we feel about something altogether. The same concept goes for False Lashes! There are hundreds and hundreds of different kinds. Lengths. Density's. Just because you hated them once, doesn't mean you hate all False Lashes! And just because you liked them once, doesn't mean you like them all either!! This is one of the reasons Trial Runs are essential. After getting a feel for the past experiences, and overall personality of our brides, we get to play around with various looks and methods to land with the one that makes each #jolbride feel THE MOST comfortable. Looking beautiful is a must. Feeling comfortable is equally as essential. Rachel has a great trick for the dewey look! "In order for you to obtain a dewey look but without actually being oily I like to highlight the cheekbones, the bridge of the nose, the Cupid's bow (right above the upper lip) and the highest point of the chin. Listening to our bride's needs is something we take extremely seriously. So a few years ago, after receiving requests for Stylists to stay on site for touch ups and/or complete Bridal Hair + Makeup re-styles...we added it to a Collection we offer. Whether you're changing into a surprise dress, or want your hair down for the ceremony but up for the reception...or, maybe you're thinking a neutral palette is best for daytime, but you want a bolder makeup look for the evening...we've got you covered! Have one of our Team Members stay on site-- available for touch ups in between photos and available to completely change your look to surprise everyone if you want! I also can't help but include this totally embarrassing picture of myself because it is just THAT hysterical- I am sure it'll make you laugh! This is from a workshop in France with Lauren Fair and Julie Paisley in August. Our beautiful model, Julie, had something in her eye and I was trying to help find it. But oh my goodness...the squat, the hand on the hip, the squint, the pregnant belly...its just absolutely hysterical!! I burst out laughing the first time I saw it! This is such a great #makeuptipmonday brought to you by Sara: "Are you in love with dewy glowing skin? If so this tip is for you! Grab yourself a liquid illuminator and add a drop into your foundation. Mix together and apply. You will have dewy, glowing skin! My personal favorite illuminator is the NYX Born to Glow Illuminator." Today's #makeuptipmonday is for those who really don't care for any light (or deep) pink or peach tones in their cheeks...but also want to add some definition to their cheek bones. Try a bronzer on your cheekbone as your blush-- it gives a Bronzed Goddess look! Our #jolbride Janine pulls it off fabulously! We alllll have days where our eyes are tired and we need to look more awake than we might actually feel. Rachel has a great tip for us! "To make your eyes look more open and awake I love to focus mascara on the lower middle lashes and upper middle lashes." Isn't that great?! Just some strategically placed mascara (and maybe a cup of coffee!) and we're on our way! Our lovely Lead Stylist, Sara, has a fabulous #makeuptipmonday for you! "Are you about to go on your honeymoon or vacation and don't know how to carry your makeup brushes? Grab yourself a traveling toothbrush holder. They will not get crushed or broken and will not be rolling around your suitcase!" Who doesn't want to draw attention to their eyes everyday...and ESPECIALLY on important days or special occasions?! Here's a great trick from Lead Stylist, Rachel: "If you want your eyes to appear brighter and bigger, I love to put a pale shadow (light gold, champagne, off white, etc...) in the inner corner of eyes."